Russian physician; born at Byelostok, in the government of Grodno, July 30, 1850. 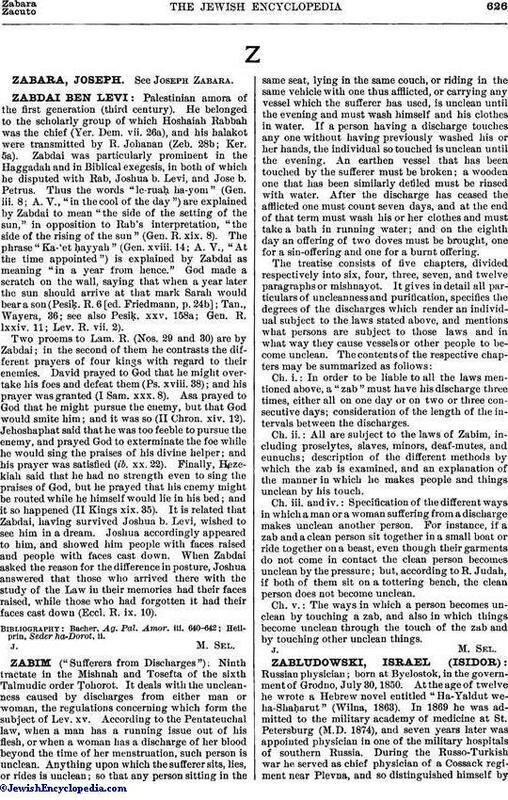 At the age of twelve he wrote a Hebrew novel entitled "Ha-Yaldut we-ha-Shaḥarut" (Wilna, 1863). In 1869 he was admitted to the military academy of medicine at St. Petersburg (M.D. 1874), and seven years later was appointed physician in one of the military hospitals of southern Russia. During the Russo-Turkish war he served as chief physician of a Cossack regiment near Plevna, and so distinguished himself byhis work that Alexander II. awarded him the second rank of the Order of Saint Stanislas. In the field-hospital Zabludowski's attention was attracted to the massage treatment practised by a Bulgarian monk named Makari, and, adopting this as his specialty, he was sent abroad by the Russian government at the close of the war to perfect himself in the theory of massage. After visiting Vienna, Munich, Paris, Amsterdam, and Berlin, he returned to St. Petersburg in 1881, and was soon appointed chief physician in the hospital of the Preobrazhenski regiment of the imperial guards. He then began to make experiments in massage on persons in sound health, and published a voluminous treatise on this subject in the "Voyenno-Meditzinski Zhurnal" (St. Petersburg, 1882). In the same year Zabludowski settled in Berlin at the request of Bergmann, whose clinical assistant he became. There he published several essays on massage, and in 1884 lectured on this subject before the medical congress of Copenhagen. 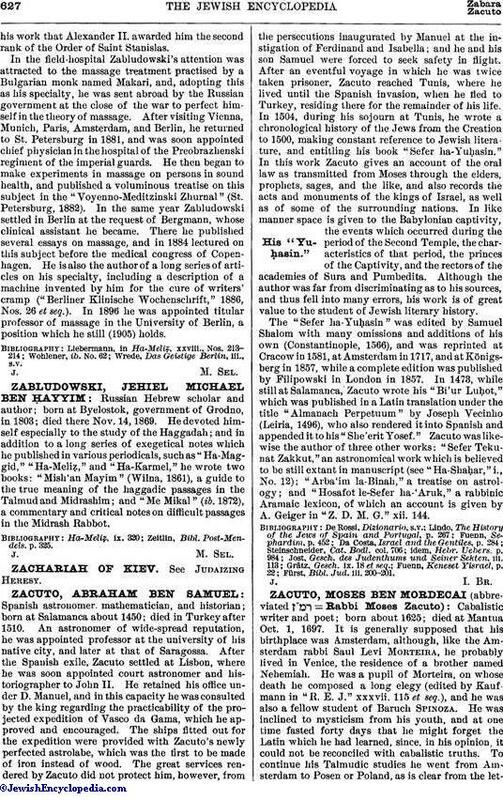 He is also the author of a long series of articles on his specialty, including a description of a machine invented by him for the cure of writers' cramp ("Berliner Klinische Wochenschrift," 1886, Nos. 26 et seq.). In 1896 he was appointed titular professor of massage in the University of Berlin, a position which he still (1905) holds. Wrede, Das Geistige Berlin, iii., s.v.